Your living room is a place where you spend a lot of time. It can be a space for relaxation, enjoying time with family, or entertaining guests. 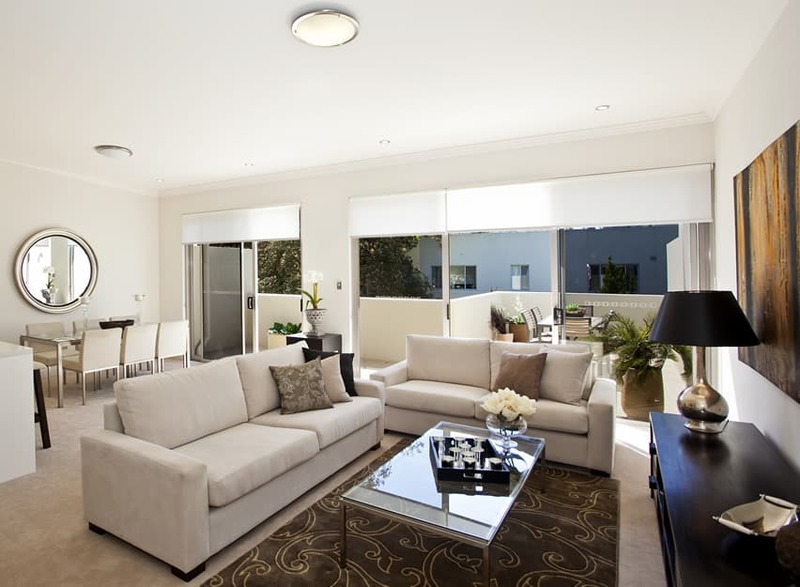 Depending on your home’s layout the living room can serve many different functions. It is often used as a formal sitting area, a place to watch TV, or socialize. Generally, a living room will feature comfortable couches, seating, coffee tables, entertainment center and possibly a fireplace. 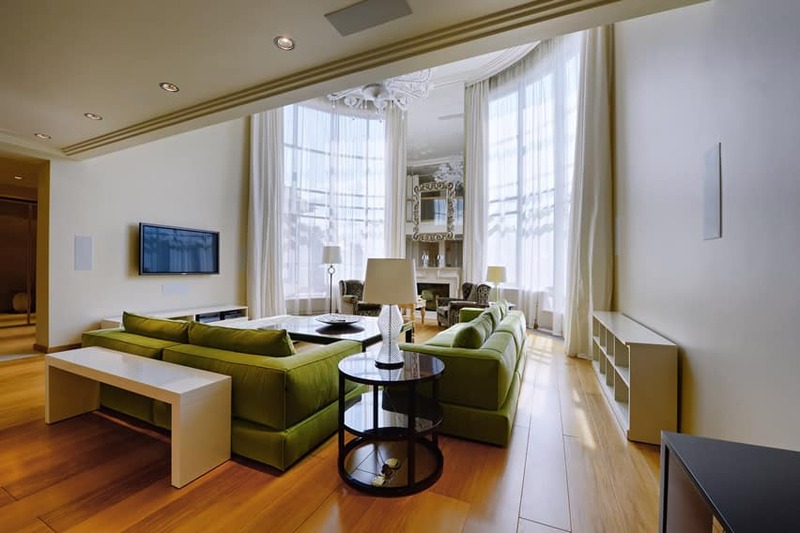 Luxury living rooms can run from minimal, to modern, to traditional, to over the top extravagance. 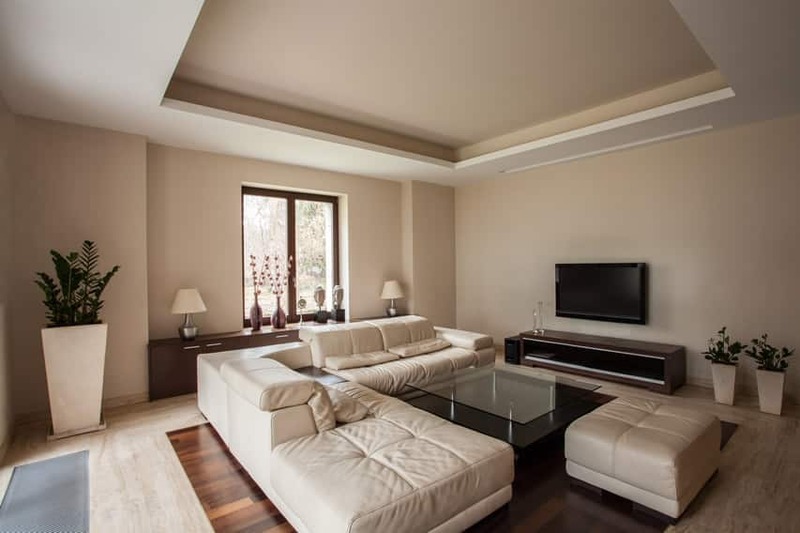 This page features luxury living room design ideas offering a variety of layouts, furniture styles and decor inspiration for your next home interior decorating project. Hopefully, these pictures will help inspire your next living room design. We start off the collection in the image above with a very elegant living space that provides ample space for conversation and relaxation. The impressive tray ceiling provides illumination and really contributes to the palatial feel of the room. Dark brown furniture surrounds the over-sized ottoman and gives this area a feeling of masculine security while also offering calm and comfort. The large area rug lends a sophistication and spaciousness to the room. A white fireplace topped with a white mantel makes an impressive centerpiece. Meanwhile the room’s large windows offer outside light and a glimpse in to the lovely garden setting. 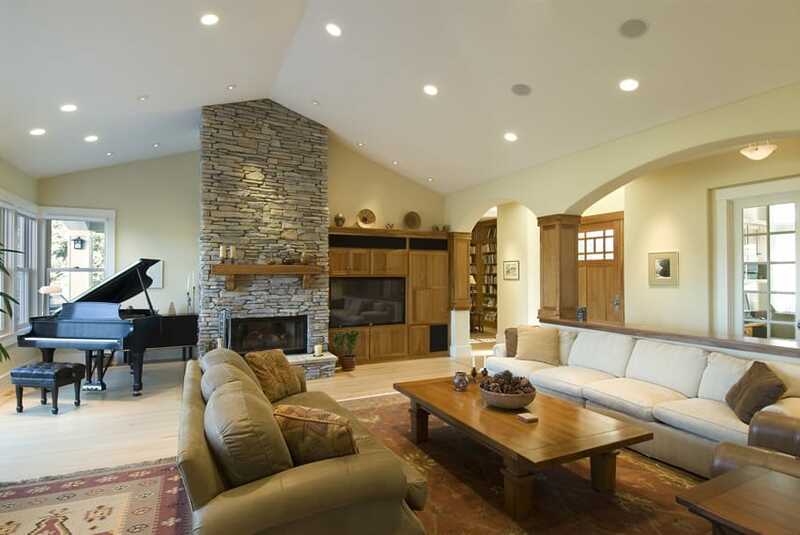 High Ceilings – Having higher ceilings at this core area of the house allows homeowners to play with their ceilings. Aside from going with the classic painted ceiling boards or bead boards, luxury living rooms can explore a coffered ceiling, that instantly gives an old school elegance. Exposed wooden beams are also a great way of framing the ceiling. Higher ceiling heights allow more headroom for larger center accent lighting such as chandeliers and exposed downlights. French doors or large windows – Being the center of the home, the living room needs to be a space of warmth and lightness. Large windows or French doors leading out into a garden or verandah are amazing features any luxury living room will have. Having these large picture windows, it is good to locate the living room facing any good views or panoramas the house has. Built-up fireplace with plate rail – A fireplace to warm the house’s hearth instantly adds class to any living room. Dressing up the fireplace in stone or brick is even better, giving it a more nature-inclined theme. The plate rail above done in Neo Classical detail for its cornice and mouldings provides a space to display exotic trinkets and accessories. Warm wood flooring and area rug – Wood plank flooring in light and warm tones help give the living room unity with the rest of the house. An area rug is a great way to highlight the living area especially if the plan is open concept and the living space is connected to the kitchen, dining and foyer. Upholstery – No living room is complete without its couch and armchair set. Luxury living room furniture comes in different textiles meant to match the style and era the house wants to imbibe. There is a great variety of leathers and soft textiles that can be upholstered into different styles from Modern to Neo Classical to Italian Gothic. Coffee table – More than just a place to put coffee, drinks and serving trays, the coffee table is the entire centerpiece of the modern luxury living room. Aside from choosing the proper materials and profile for this table, it is also important to curate the contents of the table, from interesting coffee table books to accessories that tell a story or inspire good feelings. This home from Australia makes great use of their outdoor space to make it a focal point. The large white, L-shaped sectional couch sits atop a dark black carpet offering a very clean contrast to the room. The white furniture and paint really acts to bring out the color in the decor, such as the large red bouquet. Black pillows on the couch further emphasize the theme and increase the feeling of elegance. The impressive slate fireplace makes an excellent backdrop for the white mantel with its black marble insert. A baby grand piano graces the corner of the room where one can appreciate the large white framed windows and beautiful view outside. A large brown leather sectional sofa sits on a gorgeous patterned carpet. rich brown paint on the walls offer a feeling of warmth and comfort. 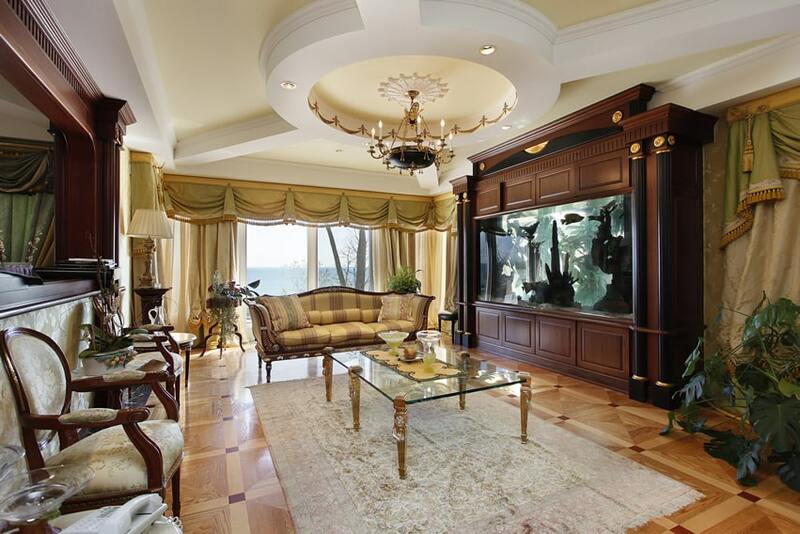 This opulent living space makes quite the impression with it’s massive fish aquarium housed in its large wood enclosure. The circular ceiling and hanging light fixture is reminiscent of an old fashioned candle-lit lamp. Intricate multicolored parquet wood flooring is both sophisticated and attractive. Classical furniture and heavy linen drapery adds to the effect of royalty. The living room in this picture is occupied by a large tan sectional couch that’s home to black pillows and is situated on a large oriental rug. A dark stained wood coffee table matches the entertainment center as well as the leather recliner with matching ottoman. The white fireplace looks handsome fronted by two large windows on either side. The intricate tray ceiling painted in white and yellow acts to elevate the senses. 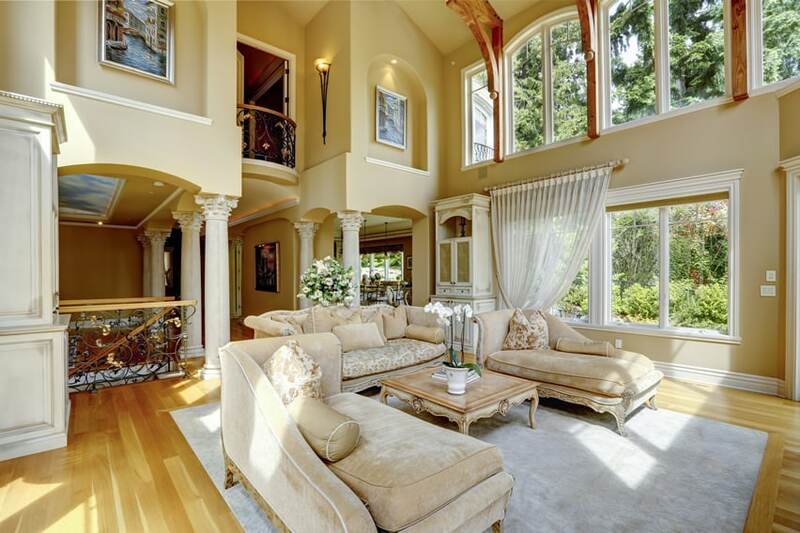 Cream valances cover the massive wall of windows found in this large living area. 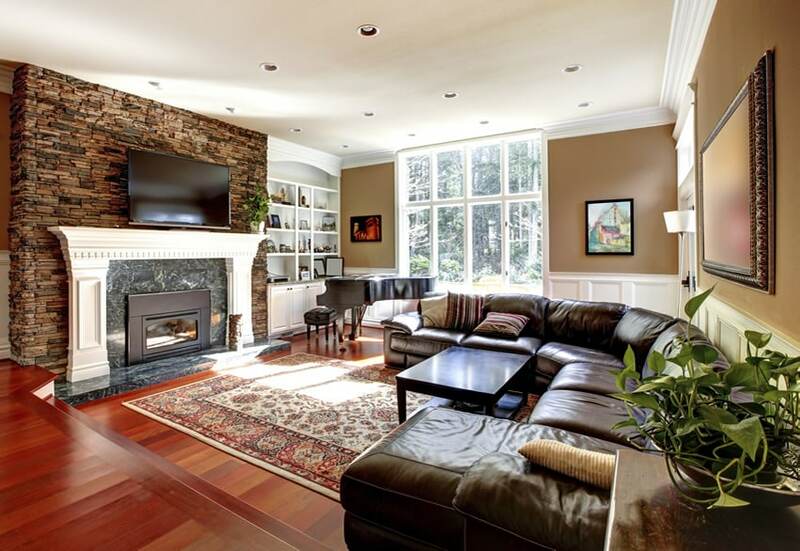 The wide brick fireplace and light colored hard wood flooring provides a feeling of charm. Classic comfortable blue couch and matching love seat give a little bit of color. 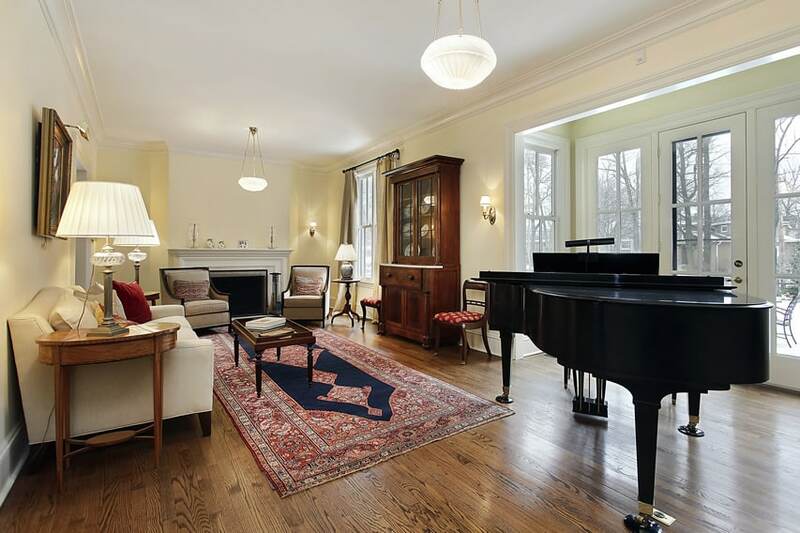 A brown baby grand piano makes an appearance in the corner and utilizes the excellent view. This South Asian inspired room makes great use of decor to supply one with an exotic feel. 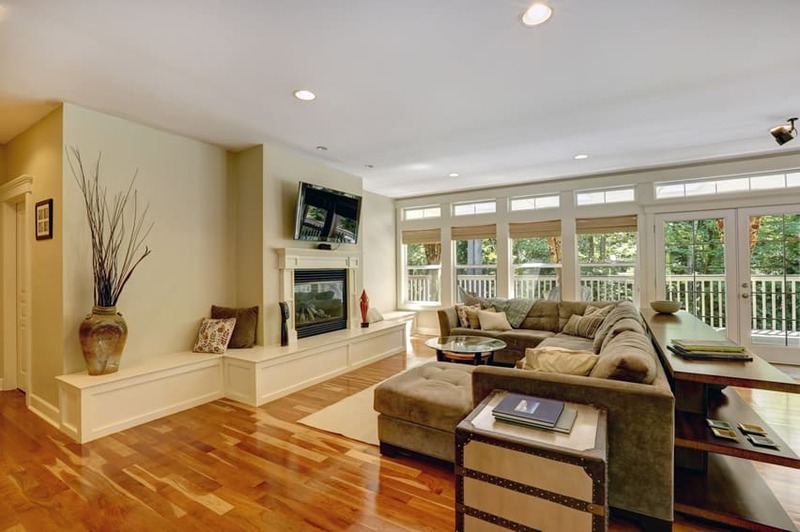 From the light wood flooring to the large center fireplace the room is adorned with style. Large circular windows provide plenty of outside light, and give a bright and cheery atmosphere. Many recessed lights in the ceiling offer plenty of illumination for reading and entertaining. 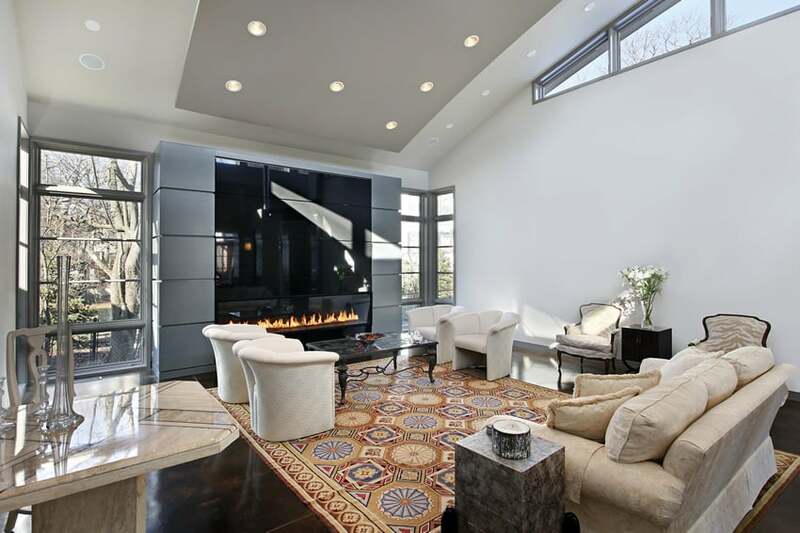 An attractive double sided fireplace is the center of attraction in this contemporary living room. A white couch sits to the side of a floral area rug, which sits upon the dark hard wood floor. A glass large coffee table is central in the space. Two orange cushioned chairs and a small round table back against the large picture window. The palm in the corner brings in a burst of green color while the yellow color of the walls uplift and stimulate the environment. 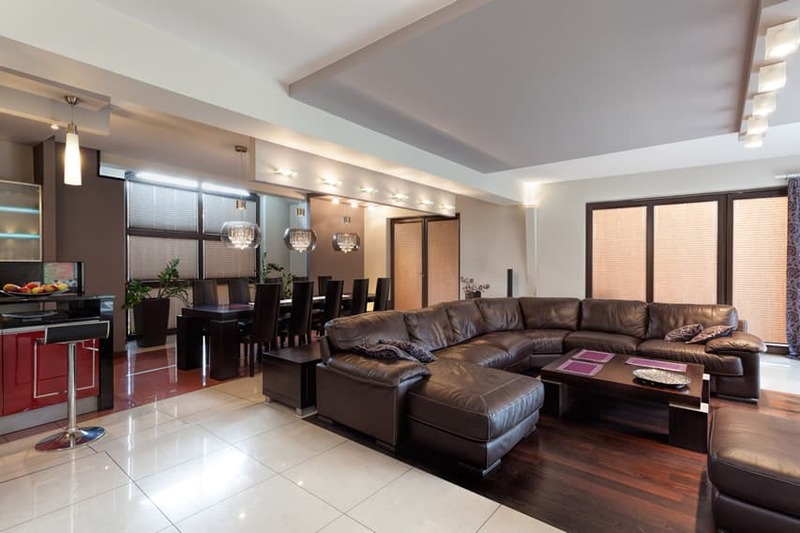 The modern living room offers brown and tan hues and stylish decor. The striped tan couch and matching loveseat faces the large wood coffee table. Recessed lighting and a white round shade pendant over the dining table gives illumination and ambiance to the room. Tan sheer curtains complete the theme and cover the array of windows. 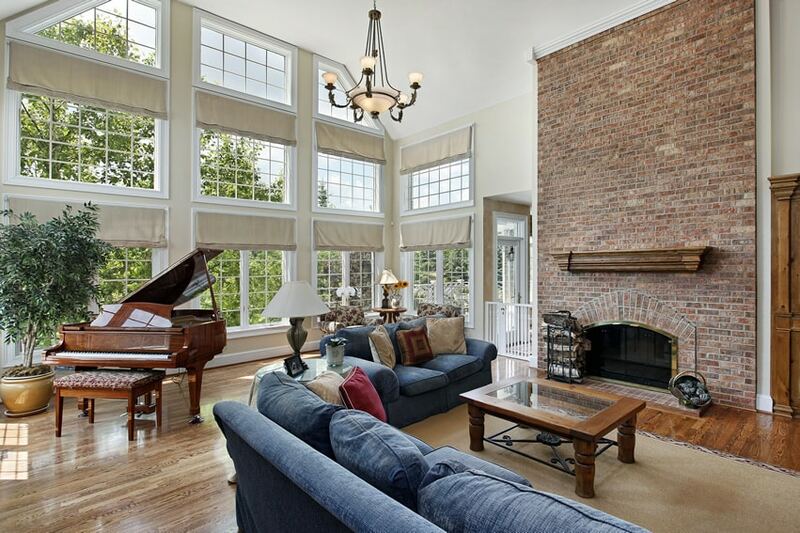 The stone fireplace in this home is inviting and makes a great complement to the grand piano in the corner of the room. Green and cream couches rest atop an American Indian style area rug of deep rust and yellow colors. An oak entertainment center back against the other side of the fireplace and offers storage and additional opportunities for related American Indian decor. Dark hardwood flooring and a chocolate brown sectional sofa give this room a soothing and calming appeal. 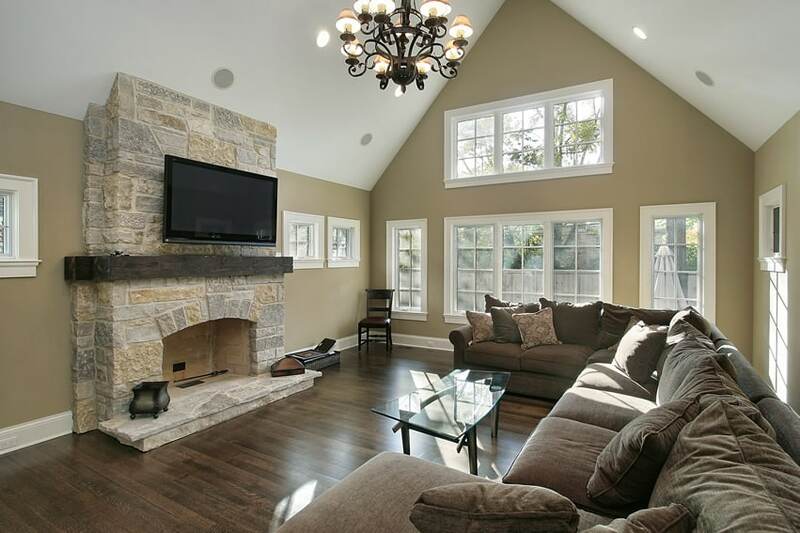 The stone fireplace makes a grand impression and serves as a focal point for watching television and hanging out. A stylish glass coffee table sits center in the room and is lit by hanging wrought iron chandelier. Plenty of white framed windows give ample lighting and the tan paint goes well with the design. This semi formal traditional style combines textures, vibrant colors and patterns to create refinement and elegance. The large stone fireplace is certainly the focal point of the rooms and makes a grand statement with its large columns and thick wood mantel. The couches are light brown and topped by yellow floral print pillows. Decorative bead-work art hangs behind the seating area and stands out against the yellow painted walls. 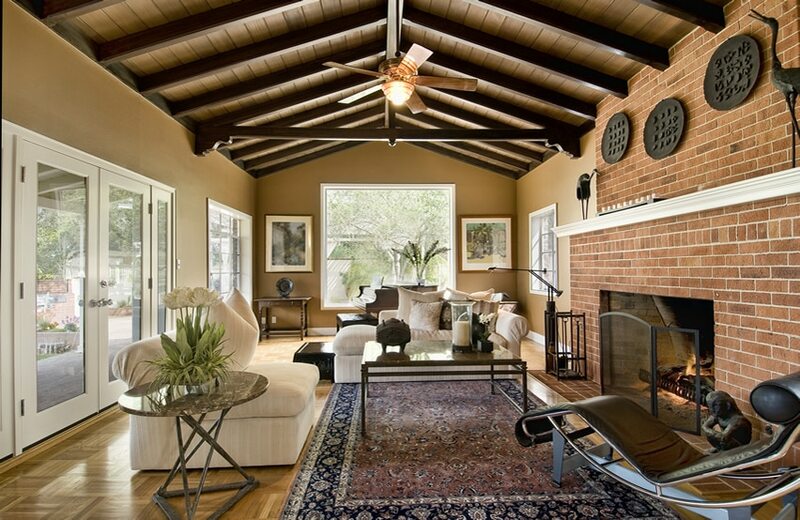 Dark wood beams on the ceiling give a craftsman touch to the living space. The white decor in this fashionable living room produces the effect of a clean and peaceful environment. Wide plank hardwood floors and custom crafted bench give a unique look and feel. 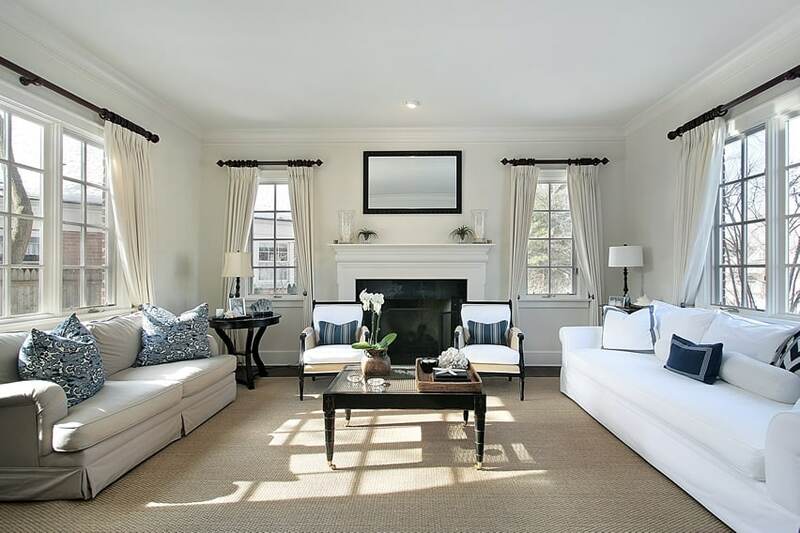 The massive white couches situated on top of the white rug keeps things bright. Colorful artwork contrast of color and the floor to ceiling windows lets in an abundance of natural light. 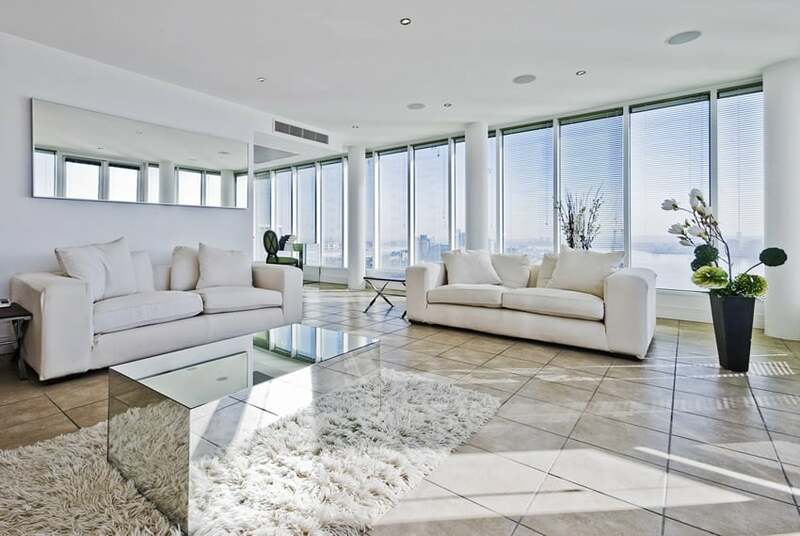 High key interiors like this white living room in a penthouse apartment help to visual extend the space. Tile flooring is covered by a white shag rug and mirrored glass table that adds personality. Twin white couches frame the room and large mirror hangs from the side wall. 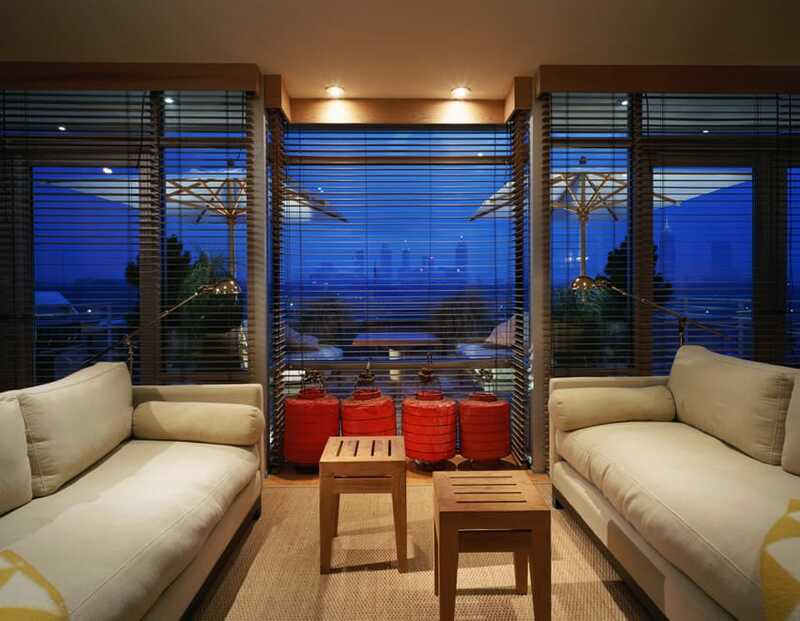 Panoramic windows provide ample views from anywhere in the room. Brown colors are often favored for living rooms because of the warm qualities they bring to a living area. This room makes good use of mocha and white accents for its steep vaulted ceiling to tie in with the white couch and loveseat along with the wood flooring and area carpet. Dark wood cabinetry and a black upright piano make great design pieces and the black curtains give contrast framing the large white painted windows. Recessed white alcoves give opportunities to display decorative pieces. Enormous windows in this house make a great first impression and emphasize the high ceilings and decorative white chandelier. White lace curtains fall the length of the windows and help mute the incoming light. Bright hardwood floor covers the floor throughout and green couches provide needed color and charm. This living room offers studied symmetry in it matching chairs, windows, couches and tables. The effect of this style provides one with a sense of power and grandeur. A white fireplace is central to the room and acts as a focal point for all. Blue and white pillows add to the pattern of the room. Exposed brick walls, a large recessed alcove give this space an attractive element of design. 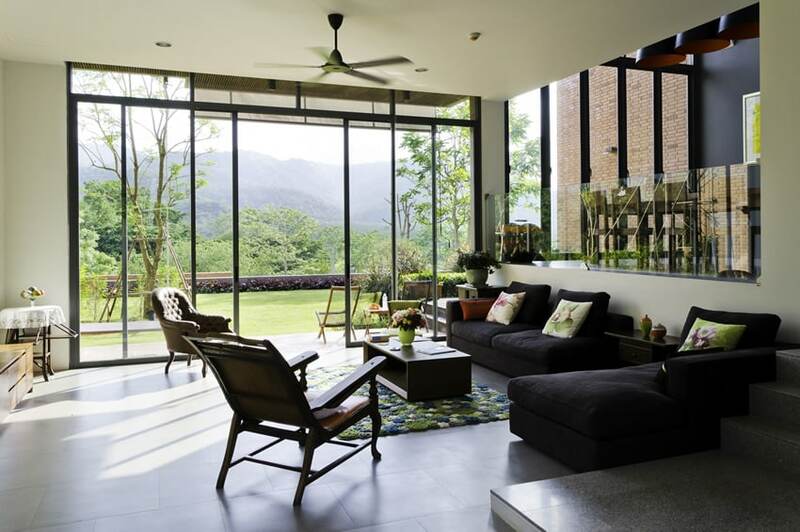 The large wall of windows gives an abundance of natural light, brightens the space. The furniture is of a traditional style that offers comfort and warmth. A large tree in the corner adds color and further uplifts the environment. 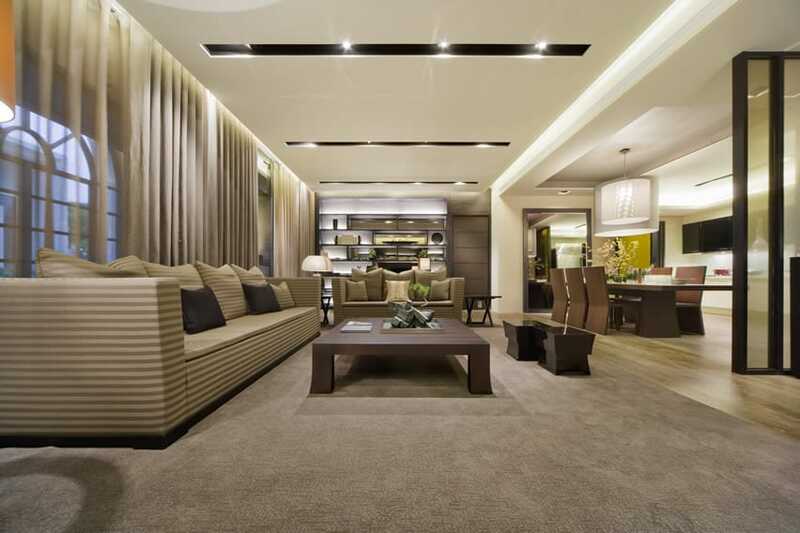 This luxury basement living room offers all the comforts one could want. The tray ceiling brightens the area with the use of plenty of recessed lighting. An elegant dark wood bar and soft bar stools make the perfect backdrop for this attractive retreat area. A huge l-shaped couch is the perfect spot to kick up the feet and watch a game on the wide screen TV positioned in the oak entertainment center. 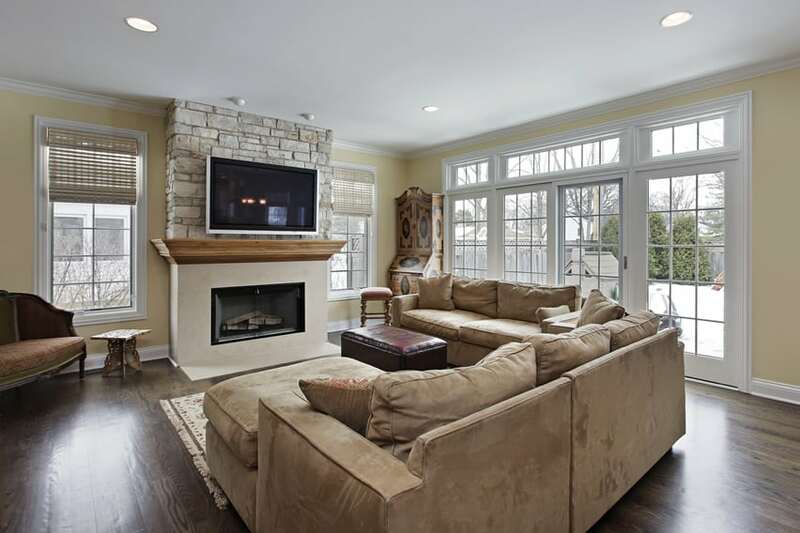 This modest living room space features darker hardwood flooring and light stone fireplace with light wood mantel. The tan sectional couches sit atop a light colored area rug and the room is brightened by a wall of windows and sliding door. Recessed lighting gives further illumination of the sitting area. Decorative pieces like the leather ottoman, brown love seat, small end table and stylish hutch add bits of flair. Attractive vaulted ceilings like the one shown here can make a great architectural statement and give the appearance of increased square footage and floor space. fireplaces can become the focal point of the room and draw ones eye. In the room above the rug and white couches are positioned to emphasize the fine features found there. This modernistic space contains a multi-toned reclaimed hardwood floor that goes well with the textured cream fireplace, leather sofas and ottoman. An attractive tray ceiling offers a darker colored paint and is stepped up to become higher than the perimeter of the room. Touches like the black based glass table , and deep brown art pieces give a warm feel to the space. 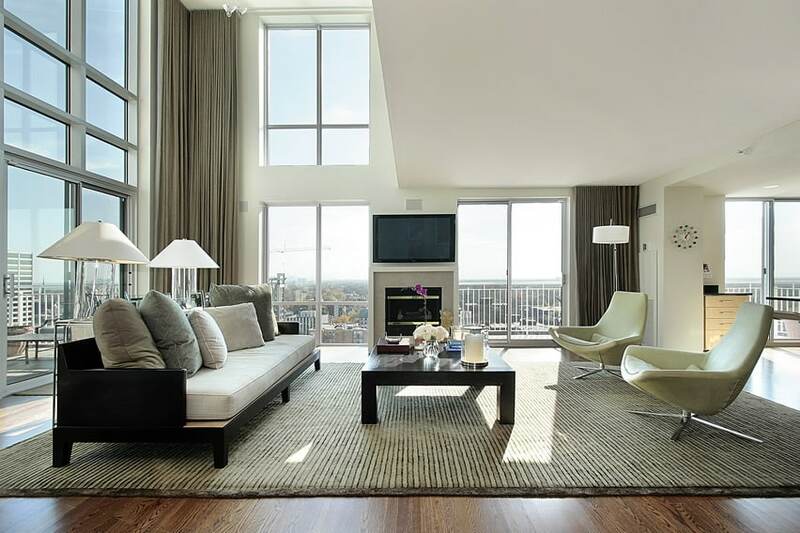 Retro seating and modern furniture stand out in this beautiful high rise apartment living room. A large striped area rug covers all of the sitting area and brings everything together. Tall windows with muted light gold drapes fit in well with the design. 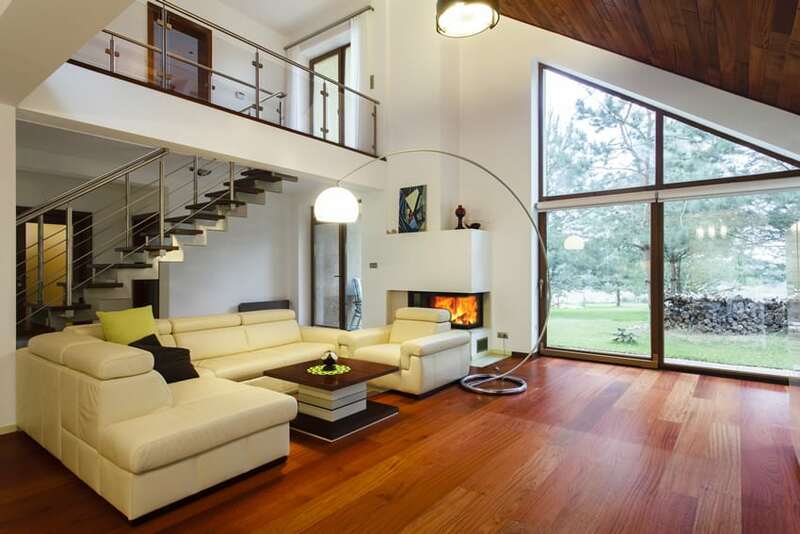 This designer house with a spacious living room has plenty of space to spread out. 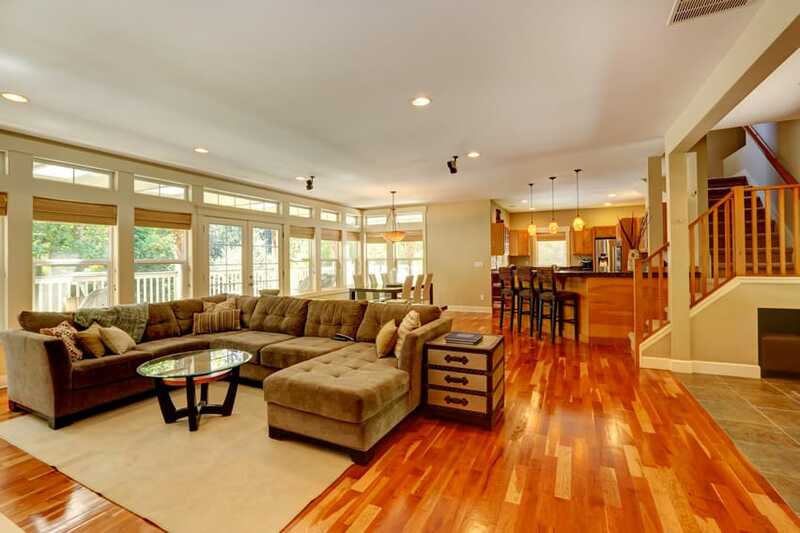 Beautiful hardwood flooring is matched by wood trim and a vaulted ceiling. 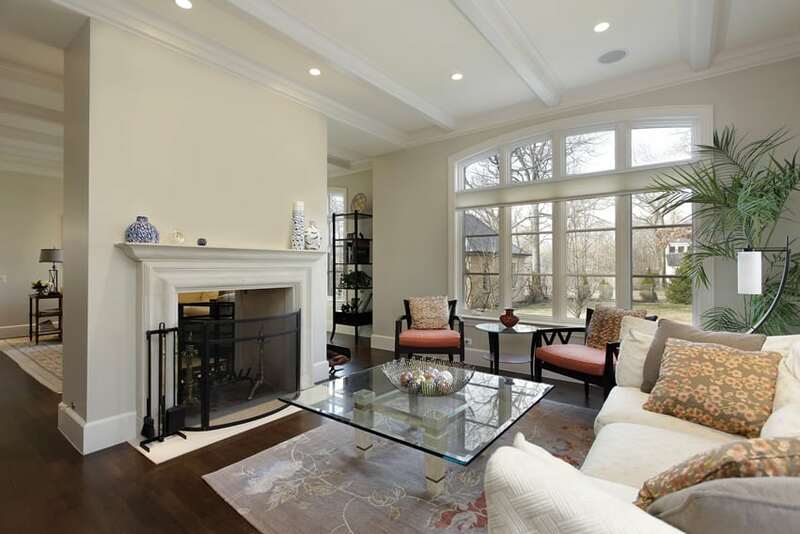 A cream colored sectional sofa and chair make a great place for conversations around the decorative modern fireplace. Stairs rise up to the loft area giving this room an extensive feel. This living room design gives off a warm and cozy feeling, with its warm choice of colors. The beautiful engineered teak wood floors are beautiful and elegant. To avoid making the room look to “heavy” with too much wood, the moldings are painted in white, while the walls are in a beautiful warm shade of beige. Beautiful Golden Oak floors warms up this cozy living room design. This is combined with a very fresh light yellow paint for the walls which helps making the room look bright and still keeping its homey feel. Moldings and ceiling are all in plain white, and there are wood-tone variations evident in the furniture pieces. 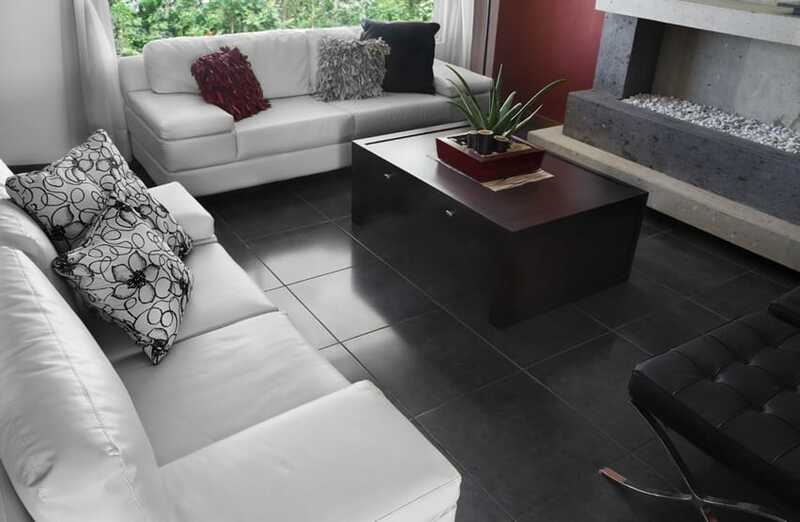 A very modern living room design, it uses black ceramic tiles for its floors. The walls are mainly white, with a maroon accent wall. The wood furniture are also dark – using a dark wenge wood stain which makes the wood appear almost black. The fireplace uses 2 colors of quartz stone, one in gray and one in a lighter shade of gray. The architecture of this space is very modern, with interesting curves and forms and very minimal details. 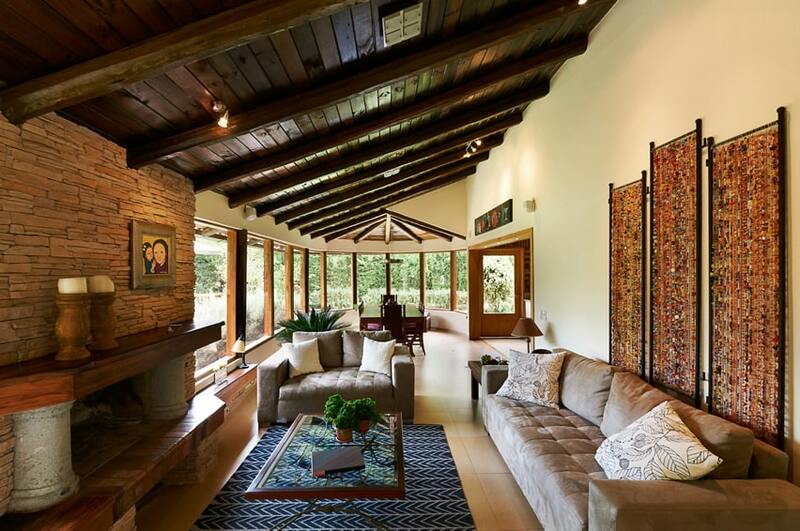 The Golden Teak wood floors, laid out diagonally, are definitely the center of attention in this interior. The walls & ceiling are kept in plain white, while the fireplace is clad with brown granite stone. This living room combines ultra-modern finishes, colors and architecture with more classical elements like furniture and patterns. The walls and ceiling are kept in plain white paint, and the floors are finished with large ceramic tiles in a dark mocha natural stone finish. The electric fireplace contrasts the rough-looking floors with its use of black graphicote glass and gray-laminated wall panels laid out horizontally. The wall frames are in a light gray color so it won’t “disappear” in the dominantly white room. These are all combined with classical furniture pieces and a Moroccan-inspired rug which makes an interesting focal point in the room. 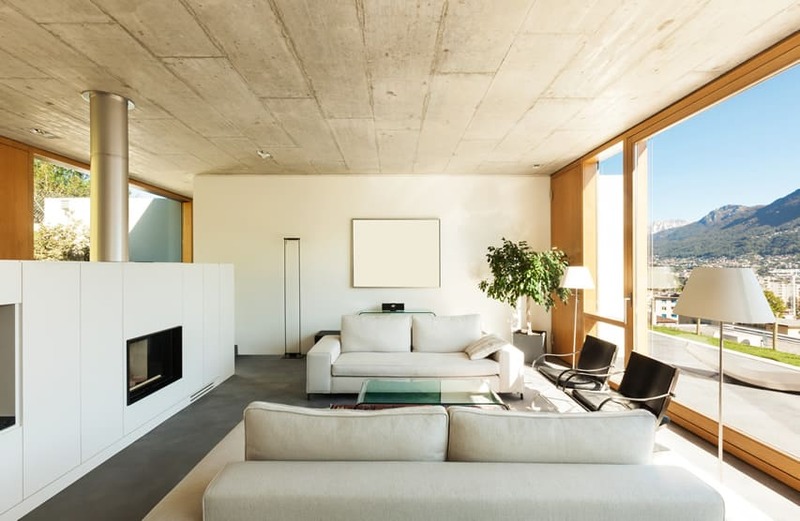 A modern minimalist approach in design, this living room boasts of its abundance of natural light. The interior finishes is a mix of rough and smooth – the rough finishes include the concrete flooring and the industrial-inspired ceiling panels made using bleached wood and stained gray. The smooth finishes include the use of laminates for the cabinets, the plain white semi-gloss paint, the satin-finish metals and the clear tempered glass of the windows and the coffee table. The wood laminates of the doors and window frames helps soften the “industrial” look and makes it look warmer. This living room keeps it warm and cozy with its use of laminated floors in beech wood finish, combined with a valence board using wood in beech color as well. 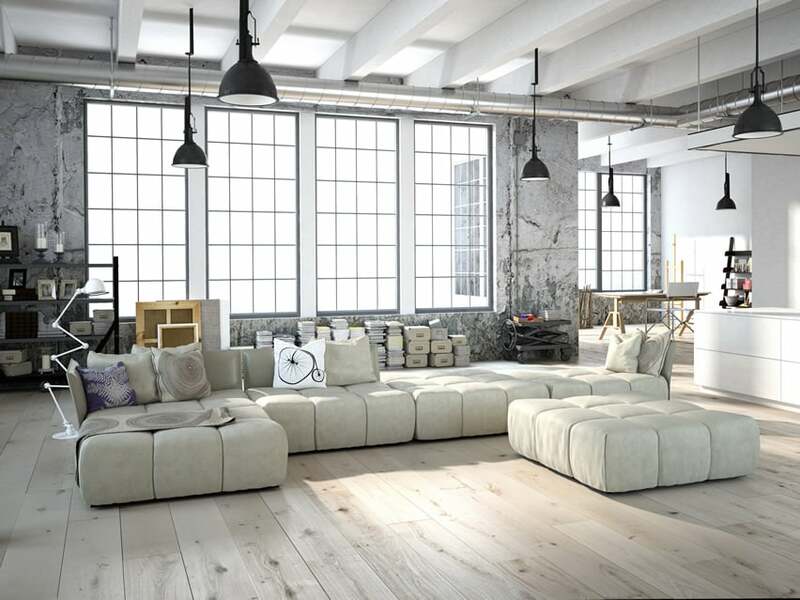 The area rug used is a jute rug in its natural colors, and this is combined with other warm elements like the wooden stool and the off-white upholstery of the two sofas. 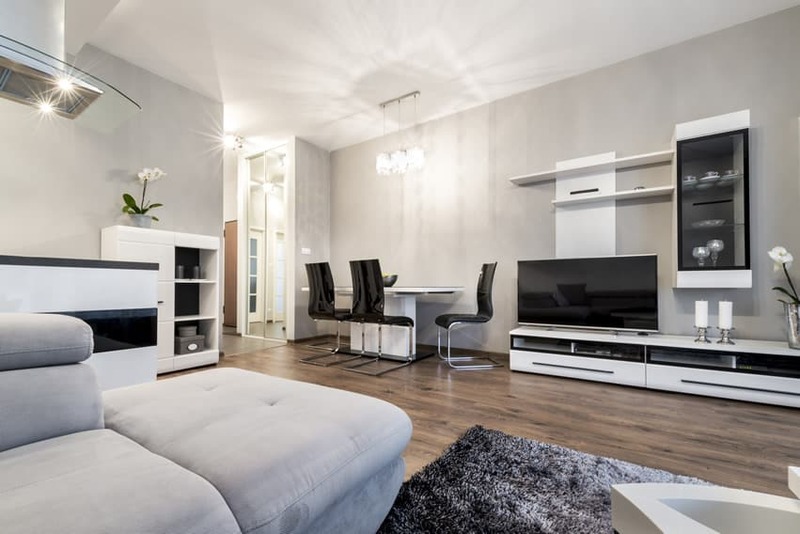 This modern spacious living room keeps its palette rather simple and straight-forward, mostly keeping it white and combining it with warm browns. The floors uses silkstone white porcelain tiles which helps reflect the sunlight entering the room. The walls and ceiling are kept in plain white, and the doors are in cherry wood finish. It also uses natural jute rug and light beige upholstery to balance the hardness of the walls and floors. This living room design goes all-out classical with its use of classic architecture-inspired elements. The finishes used are a bit more modern, using laminated Oak floors instead of solid oak floors. The walls and ceiling are painted in plain beige, with other elements like moldings and cabinets painted in antique white finish. Over-all, the room uses mostly warm wood tones and warm-colored paint and furniture upholstery. This living room uses modern finishes and furniture pieces. The use of engineered bamboo flooring for the floors and the accent ceiling is both environmentally-conscious and a beautiful choice for flooring. The steps for the stairs uses hardwood beech planks in a similar tone with the floors, while the rest of the walls and ceiling are kept simple with plain white paint with wenge cornice and baseboard. This living room has a beautiful combination of rough and smooth finishes, creating an interesting industrial-style look. The floors uses engineered wood in bleached walnut finish , while the walls have a more distressed look as it uses rough raw concrete finish. The walls are simply painted white, with exposed trusses and stainless steel pipes. The choice of windows with black powder-coated framing completes the industrial look of the space and also lets in much natural light to enhance the drama of the space. This modern living room has an interesting combination of finishes. The floors are hardwood golden walnut, while the accent wall in the living area uses stamped concrete panels. The stairs and the bar area is in a darker walnut finish, but the ceiling is the most unique feature of this room. It uses green-tinted mirror panels with metal trusses painted white. 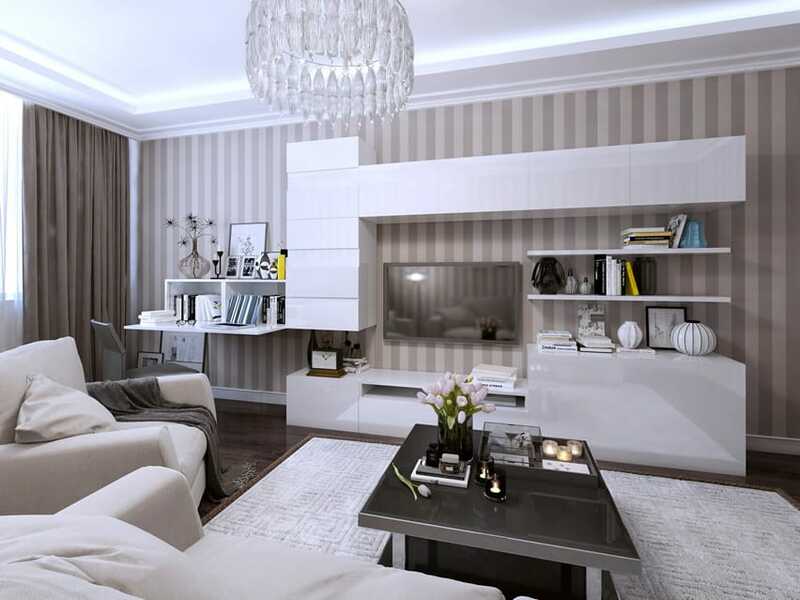 This living room design perfectly combines hard and soft elements and makes it work. 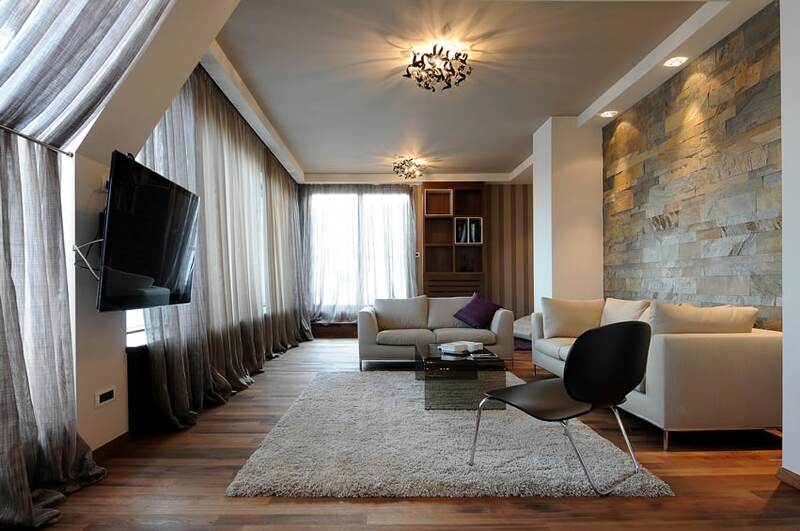 A living room design that gives off a masculine vibe with its choice of colors and finishes. The walls uses dove gray paint and the walls uses dark, Teak wood laminated floors. The ceiling and furniture pieces are mostly kept white, while the sofa uses a light gray upholstery in a cooler shade than the walls. The high-pile dark gray rug also helps soften up the whole look. 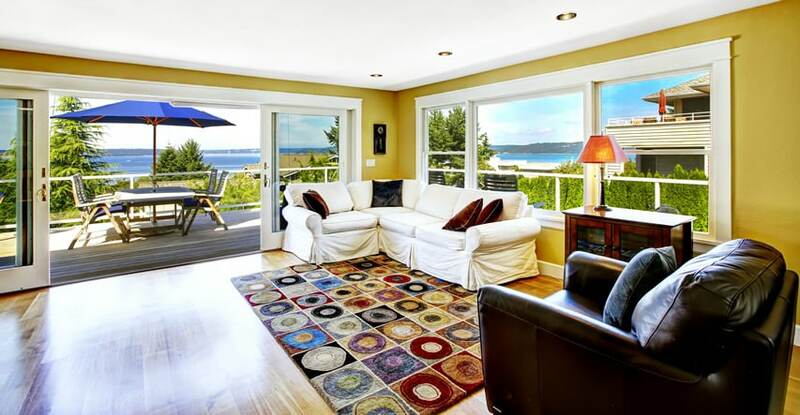 This living room boasts of a magnificent view and excellent choice of furniture, colors and materials. The floors are of engineered walnut, and the walls are a combination of plain white and a dark shade of warm gray. 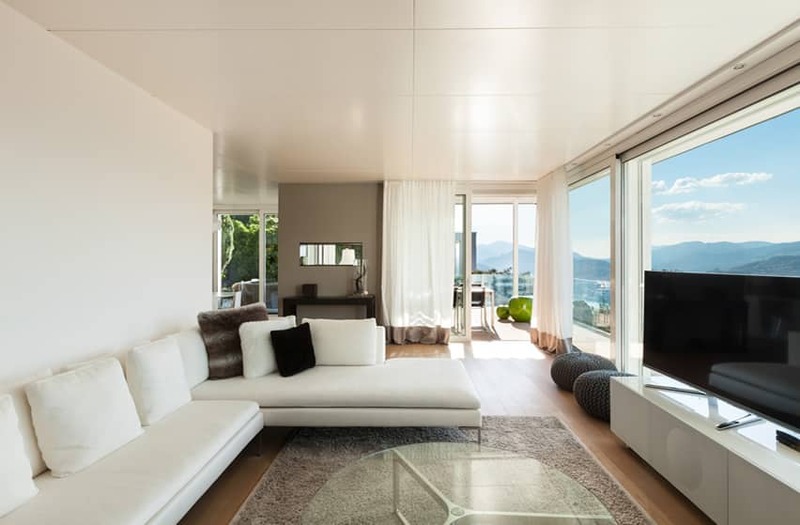 The ceiling uses laminated panels which are semi-reflective, and the rest of the room uses softer elements, like the choice of rug, sofa, stools and curtains to make the room softer and warmer-looking. This living room design opts for a softer material for its floor – carpet tiles in a light beige colors. The walls are painted is a very light off-white color, while the moldings and the ceiling are kept in plain flat white paint. To balance the softness of the floors, the window and door frames, as well as the tables and chair legs uses stainless steel. A large living room with classic and country inspiration. It combines its modern cherry laminate floors with light cream wall paint and white ceiling and moldings. The columns are finished with cream-colored marble, and the counter face uses white-painted wood planks with white balusters for support. 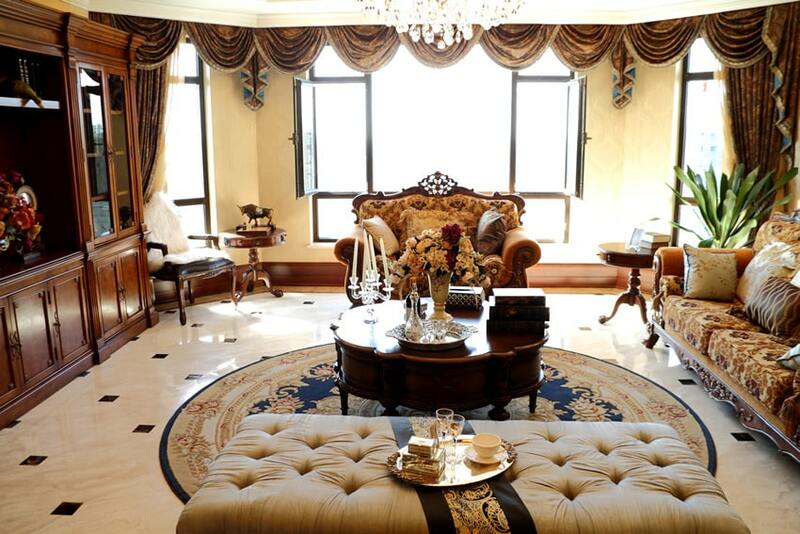 All of these are combines with antique furniture pieces with patterned fabrics and an elegant rug and window draping. 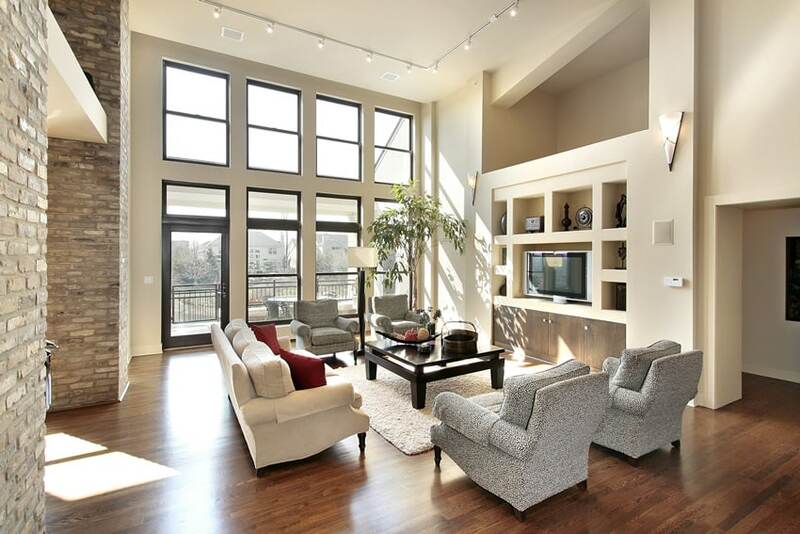 This modern living space boasts a large picture window and a very unique choice of finishes. While most of the room is kept minimal using white ceramic tiles, white paint walls and doors, the ceiling uses wooden acoustic panels in cherry wood finish. 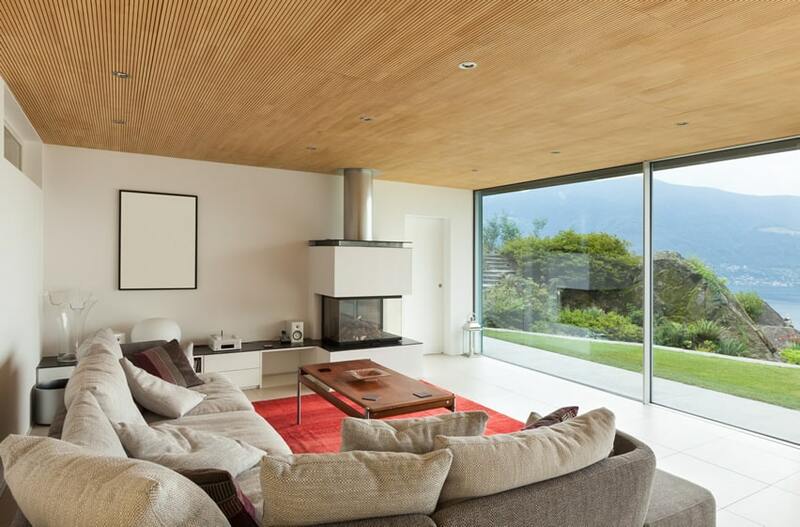 This reverses the typical wood floor-white ceiling combination and also makes this room excellent for entertaining for its acoustic ceiling panels. This living room uses modern furniture pieces, as well as modern finishes. The floors uses cream marble porcelain tiles, while the walls uses laminated metal panels, as well as laminated panels in dark wood finish and printed finish. The ceiling is simple and modern as well, using cove lighting to give a softer look to the space. A living room design that reminds us of warm cozy summer days. The walls are painted with a very bold mustard yellow, combined with cherry hardwood floors. The moldings, doors and windows are all in white so that it pops out of the yellow walls. This is combined with a white ceiling, and softer fully-upholstered furnishings. This living room has a modern Asian feel. The floors are simply made out of off-white porcelain tiles, while most of the walls are in white, the accent walls uses high-gloss porcelain tiles in black and white, forming an interesting geometric pattern on the wall. 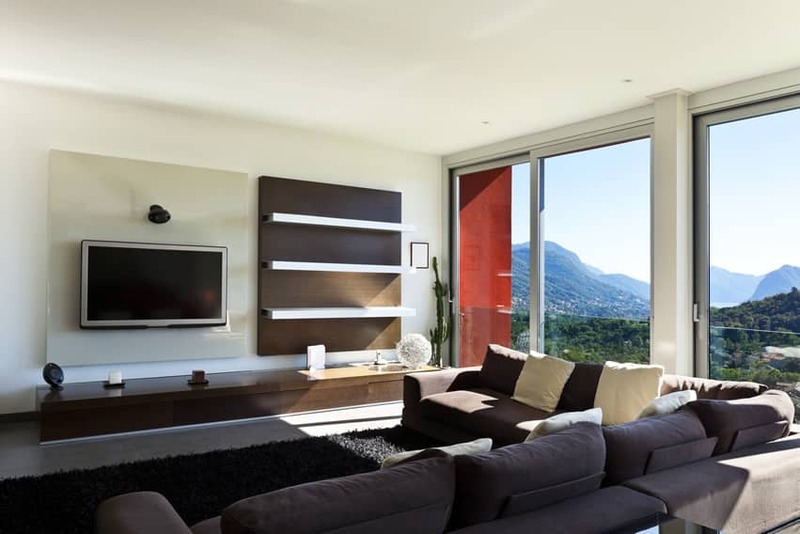 The back of the TV has graphicote glass panel with stainless steel edging, while the doors and windows have dark brown powder-coated frames that matches well with the wood finish of the furniture pieces. 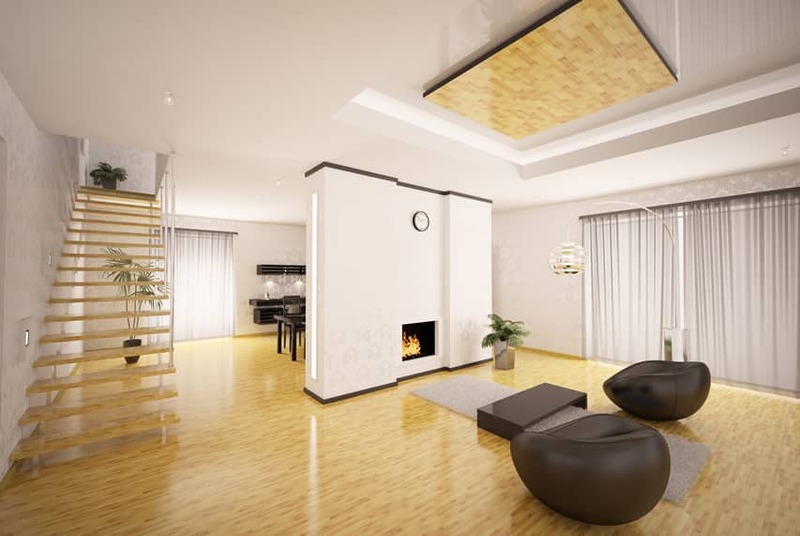 A minimalist living room which only uses few finishes but has an elegant modern feel. The walls and ceiling are kept plain white, while floors uses off-white porcelain tiles. This is combined with dark wenge wood which is used on all wood moldings, door frames, beams and the wood stairs. 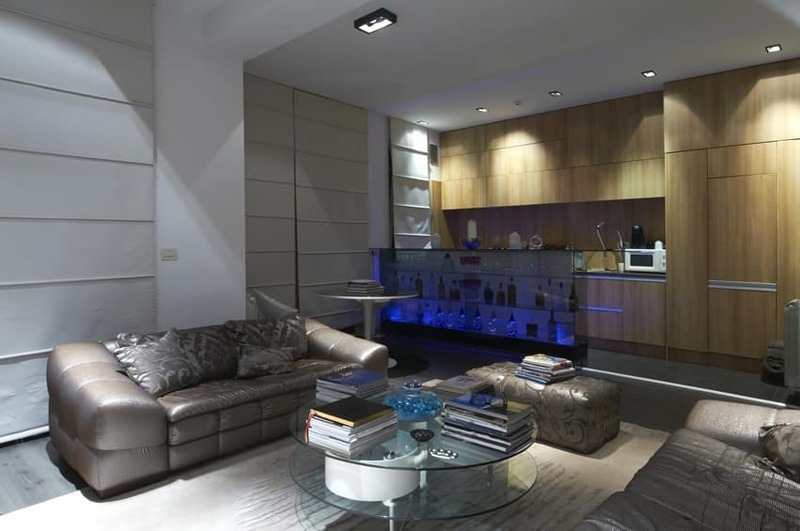 A modern living room design which uses modern materials and furnishings. The floors are gray laminated walnut, while the walls and ceiling are plainly painted in white. The kitchen uses beautiful pine laminates and helps make the room warmer. This is combined with leather-upholstered seats, tempered glass, stainless steel and a very contemporary approach in lighting. This open-plan design has a good combination of cool and warm colors, combining warm woods with cool green fabrics which makes the over-all interior fresh and easy on the eyes. It uses engineered oak floors for the dining and living room and plain white ceramic tiles for the kitchen. The walls, ceiling and all moldings are all in white, and the kitchen cabinets uses dark oak laminates and stainless steel counter top. 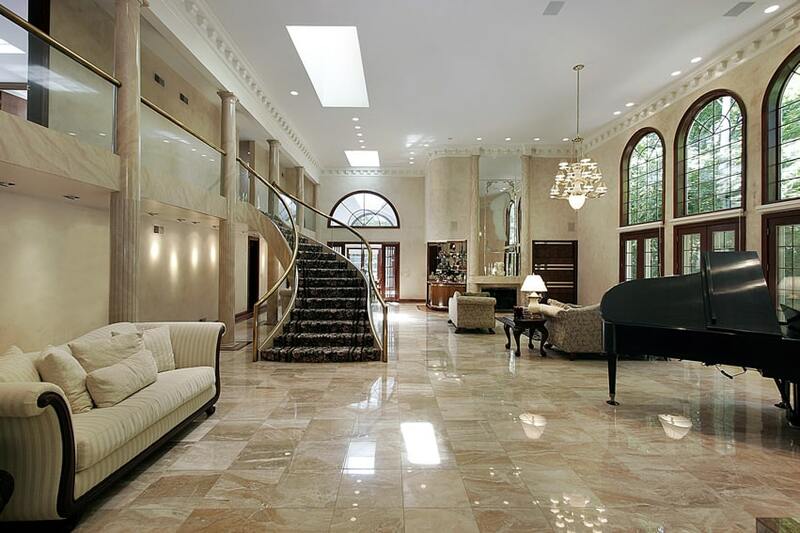 A very grand and elegant living room design, this space uses top-notch cream marble floor tiles. Even the columns are clad in marble, and the walls are painted with faux marble finish. It also uses gold-finished hand-railings instead of chrome and combines it with glass for a more modern feel. 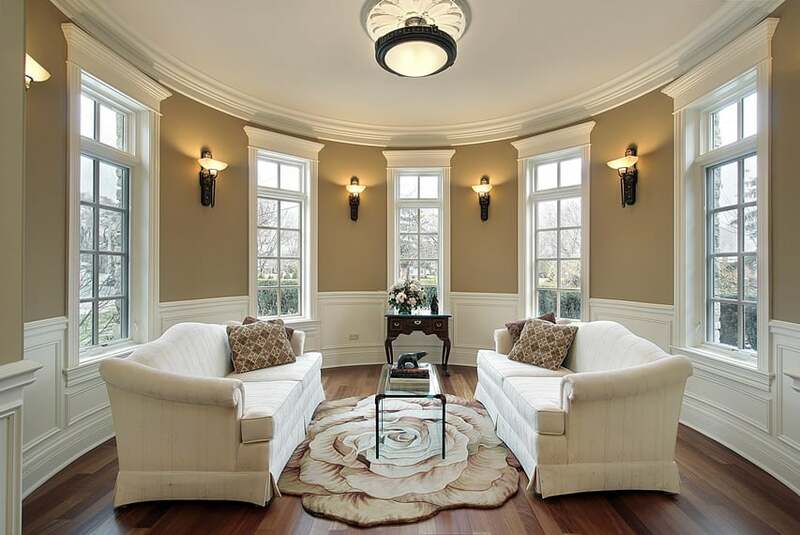 The moldings are painted in off-white, while the ceiling is in plain white finish. The windows and doors are all in oak wood finish. 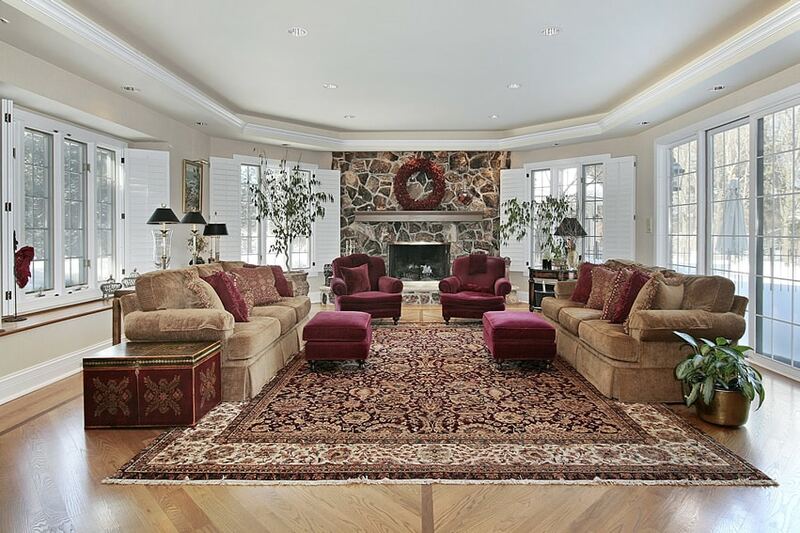 A large natural stone fireplace and area rug act as the centerpiece of this corner living room. Matching wing chairs, ottomans and couches provide perfect symmetry. The white indoor window shutters can be used to cut down on glare and make a great decorative addition. The first thing you will notice in this living room design is its very characteristic cherry wood floors and the teak wood panels on the fascia of the bar counter. The walls are of light beige, combined with white moldings and white door and window frames. The soft furnishings are also in warm tones, mostly using brown fabrics and coffee colored wood finishes. Gorgeous Elm wood laminated floors are combined with light beige walls white semi-gloss finish. A large sectional sofa and matching ottoman make this a relaxing space to catch a game or movie on the TV. Wood shelving behind the couch and rustic storage chest offer plenty of areas for storage. A long row of pictured windows and double doors shed plenty of natural light. 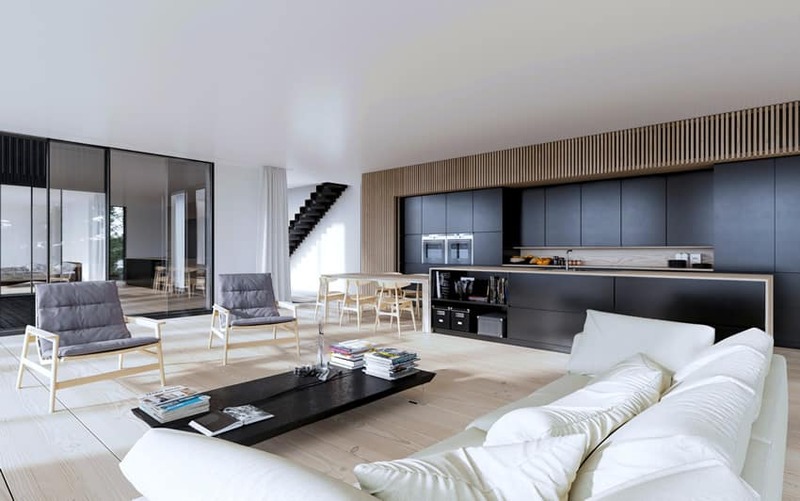 A Scandinavian-inspired living room, this design uses beautiful contrasts of colors and textures, The floors are of laminated bleached oak, while both the walls and the ceiling are painted white in semi-gloss finish. The kitchen cabinets are laminated in coffee brown, surrounded by very interesting vertical acoustic panels in light oak finish. The window and door frames uses a coffee toned finish similar to the wengue wood stairs. This entertainment pad uses contrasts of colors. The floors are of engineered dark walnut, with walls covered in wallpaper with vertical stripe patterns in mocha and light mocha. The moldings and ceiling uses white paint, while the cabinets and other furniture pieces uses high-gloss white paint finish. 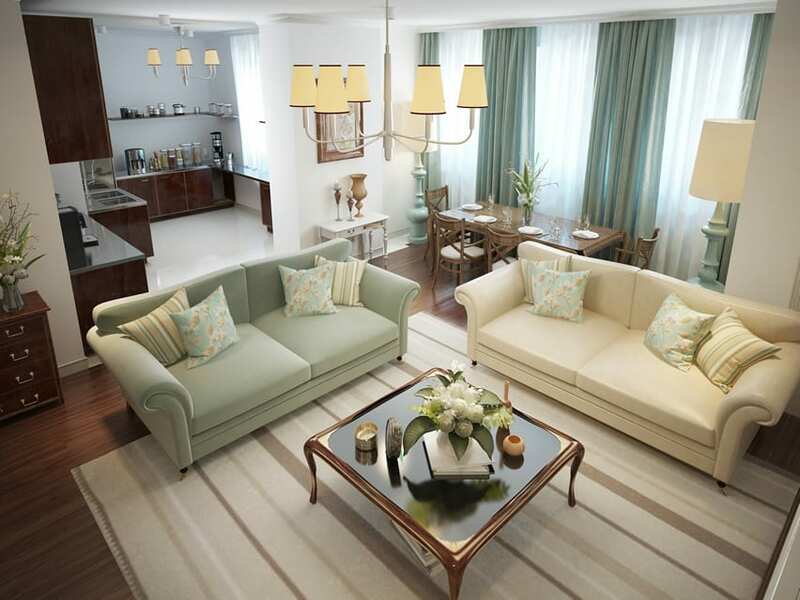 The soft furnishings are in light cream color, while the curtains and coffee table adapts the mocha tone of the floors. This modern living room has interesting choice of finishes. While the floors uses beautiful teak wood laminate floors, combined with white paint and light gray for the walls and ceiling. And accent wall behind the sofa gives a rough, natural outdoor feel to the room, by using natural ledgestone cladding. The wall behind the bookshelf on the other hand, uses a classic wallpaper with vertical stripe patterns in mocha and light mocha. The sheer gray curtains softens and balances the warm colors with its cool gray tone. 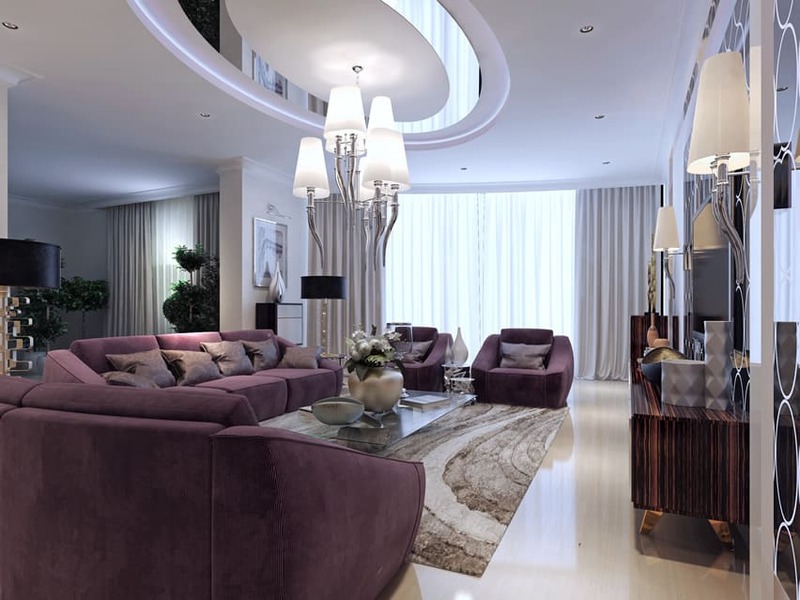 Another contemporary living room design with its focal point being its grape-colored upholstered seats, the rest of the room uses simpler finishes. The floors are simple porcelain tiles in light cream, while the walls are in off-white and the ceiling in white. The ceiling also has an interesting oval-shaped recess with an oval mirror in around the center. The TV wall uses graphicote glass panels with circular designs while the warm color of the zebrawood entertainment table helps make the mood warmer. With its heavy imperial style furniture, the rest of the room keeps its finishes at a minimum to make the room look fresh and light despite the heavy intricate patterns on its upholstery and area rug. The floors are in a neutral shade of solid Oak, while the walls are in a very pale yellow-cream paint. The moldings and walls are all in white, and to make the look even softer, plain white sheer drapes were used to crown the windows. 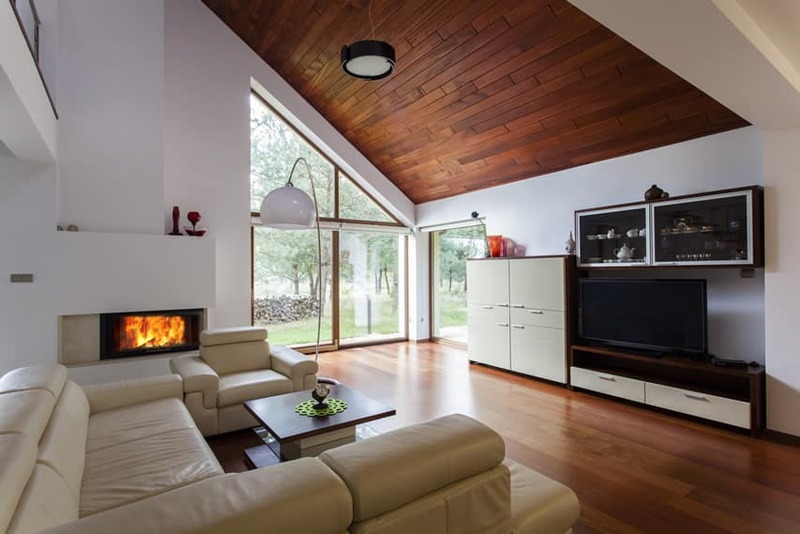 This modern living room is spacious and warm. The floors are of a gorgeous shade of engineered cherry wood, while the walls are kept plain white. The focal point of this room would be the beautiful solid sandalwood planks on the ceiling. The doors and windows adapts a wood tone finish for its frames to help put together the look, while the furniture pieces like the laminated cabinet and the sofa set are in light cream color. Another design with open-planned space, this design uses a combination of traditional and modern furniture pieces and materials. The walls and ceiling are in a light cream shade of paint, while the floors use 30×30 ceramic tiles in a subway tile layout. The stairs and its landing is clad with salt and pepper stone and the accent wall is painted in a dark gray color. 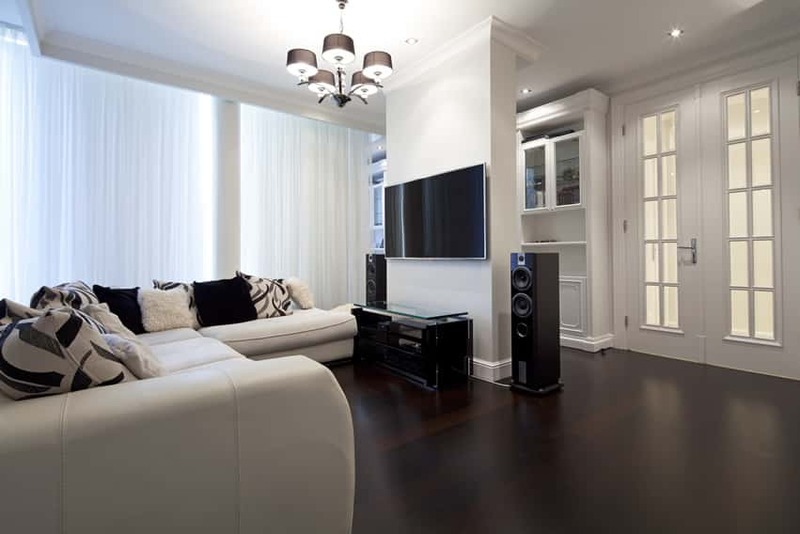 This entertainment room uses a very dark shade of walnut for its laminated floors. To balance this out, the walls are painted with light dove gray, while the ceiling, moldings, cabinets and doors are all painted in white. The large sofa is upholstered in white faux leather, and to soften the look of the room, white sheer curtains were used for the large windows. 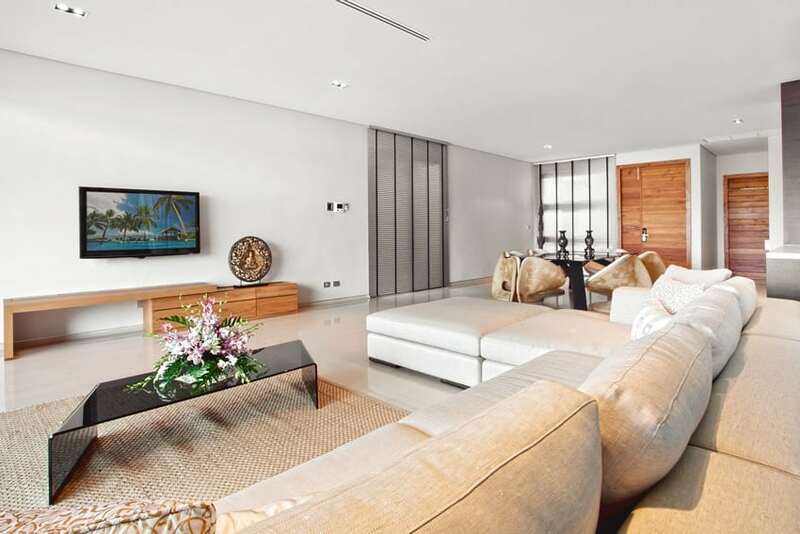 This living room plays with different shades and tones of brown from its floors, to its walls and soft furnishings. The floors uses engineered floors in Ash wood finish, while the walls are painted in beige. 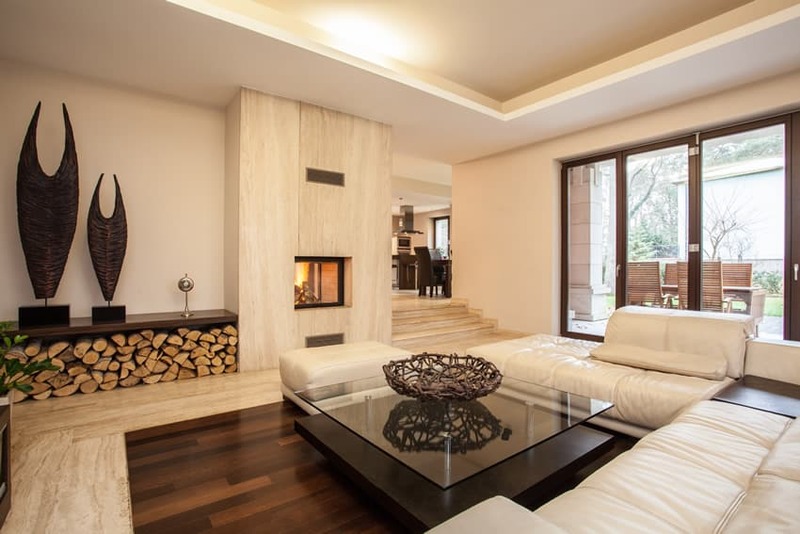 The wall in which the fireplace is attached to is clad with natural limestone, while the rest of the details like the fireplace, the moldings, doors, windows and ceiling are all in white. The wooden furniture pieces are in coffee wood tones and the fabrics used are different shades of brown with different textures and tones. This living room is reminiscent of old English interiors with its elegant drapes and heavily upholstered furniture pieces set in a more modern architecture. The flooring material is the classic cream marble with dark gray 4″x4″ accents of tiles. The cabinets and other wood elements are of hardwood in a red-orange sandalwood tone, including the baseboards, while the walls are clad in cream-colored wallpaper with intricate patterns. This design is an interesting combination of colors and finishes. Most notable is the use of different materials for the floors with not transition material. It uses an alternate of dark walnut engineered wood with ceramic tiles in gray wood finish. 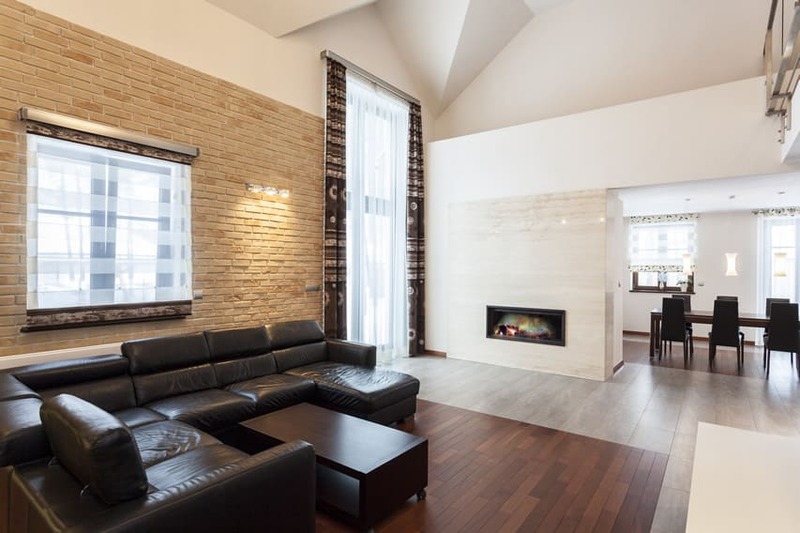 Even the walls uses interesting finishes: while most of it is painted white, the wall for the fireplace is clad with synthetic granite, while the wall behind the sectional sofa is clad with pieces of sandstone cut and laid out on the walls like bricks. Many luxury living room design ideas use light color wood flooring to help brighten up the space. 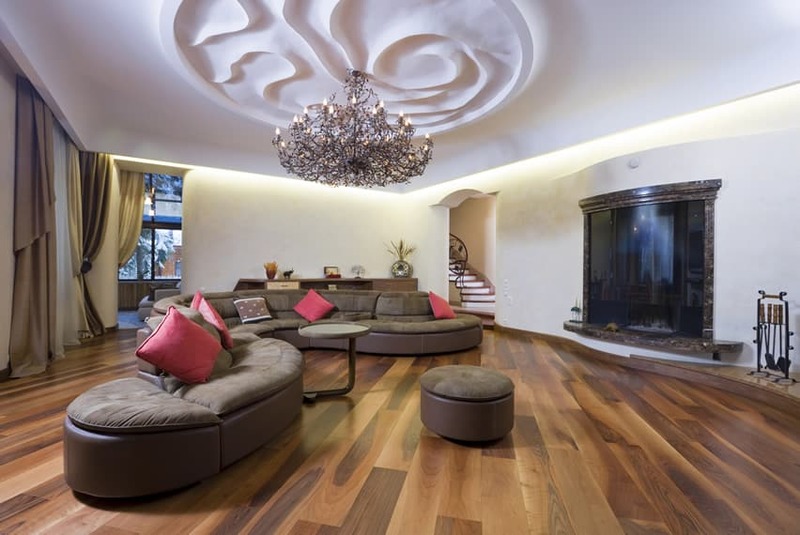 Beautiful Pine engineered wood floors is the center of attention in this lovely interior. This is combined with faux marble paint finish for the walls, with matching Teak wood frames for the doors and windows. Cabinetry also uses solid Teak wood, and the kitchen counter top and walls are clad with black granite material. 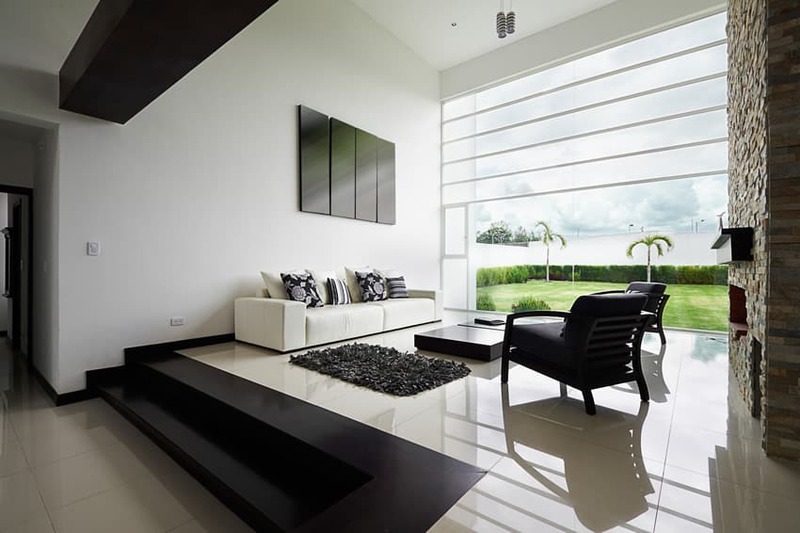 This simple and modern living room, uses 30×30 concrete-finish ceramic tiles, with simple white walls and ceiling. The furniture pieces are laminated with dark walnut, and to give a different texture to the walls, the shelves are in chrome finish with the back of the TV installed with an off-white graphicote glass panel. Luxury living room design ideas often focus attention around a focal point in the room. 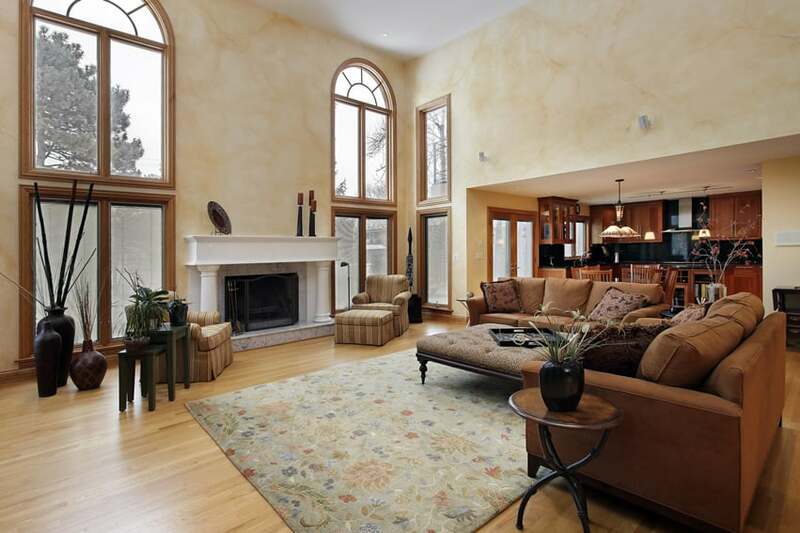 The large wall of windows and the fireplace both vie for attention in this luxurious space. Beautiful beech wood laminate flooring adorns this cozy living room, combined with square modular wall panels in a more neutral shade of beech wood for the accent wall feature. The electric fireplace is surrounded by natural stone tiles in a light beige color similar to the pain used for the rest of the walls. An interesting way to combine flooring materials, this design brings your eyes to the center of the room – the living area – by framing its dark walnut wood flooring with Italian Porcelain sandstone finish tiles. The walls are kept simple with its light beige paint and bleached wood baseboard, while the ceiling is a combination of flat white and flat light beige. A mix and match of materials, this interior boldly mixes flooring finishes. The living room area uses dark walnut laminate flooring, the dining and kitchen area uses red-orange ceramic tiles, while the rest of the area uses white ceramic tiles. The walls are in dove gray, with its main ceiling in white and an accent ceiling in dove gray paint finish as well. The kitchen counter uses red graphicote material for its surfaces combined with black solid-surface material for its counter top and splashboards.